Patching or occlusion is a common and important treatment method for amblyopia. Amblyopia or lazy eye is the reduction in vision in an eye that has not been adequately used during childhood, resulting in underdevelopment of the visual pathways for that eye. The eye is usually physically normal without any sign of any organic disease. The visual pathways that connect the eyes and brain develop throughout childhood until about the age of 8 years, but particularly within the first 2 years of life. Beyond 8 years, the visual system is fully developed and the connections and nerve pathways are no longer able to change or improve. Occlusion treatment must therefore be performed as early as possible within the first 8 years of life for it to be successful. This is why vision screening should be conducted when your child reaches the age of 3 to 5. Patching involves physically covering the dominant stronger eye, which is the eye that your child prefers to see out of. This forces the weaker amblyopic eye to work harder, thereby enhancing visual pathway development and strengthening the vision in that eye. Occlusion can be performed by directly covering over the good eye or by occluding the spectacle lens in front of the good eye. There are many patches available for purchase over the counter and over the internet, and these can either be adhesive or non-adhesive. Get one that your child likes - this will encourage your child to wear it more often. Amblyopia treatment with occlusion and spectacle correction. The amount and duration of occlusion depends on how severe the amblyopia is. For best results, there has to be at least 2 hours of occlusion daily. As too much occlusion of the good eye can result in amblyopia in that eye, occlusion is not recommended for more than 6 hours daily. The best outcomes are achieved if occlusion is started before the age of 5. To obtain the full benefit, ensure that your child actively uses the vision in the amblyopic eye during occlusion of the good eye. When the good eye is occluded, engage your child in activities such as watching television, reading, writing, painting and pasting. Initially your child's hand-eye coordination will be poor so start with simple activities to help build confidence. Also make sure that your child does not peek around the patch. - Explain to your child the importance of occlusion and the consequences of not doing so. - Make your child feel special when wearing the patches. Decorate them with stickers, crayons and whatever else you can think of. Encourage your child to have fun at the same time. - Get help from your child's teachers. They play an important role in getting other students to accept your child and to help your child feel more comfortable in class. - Positive reinforcement and rewards do work. But sometimes, more drastic measures such as elbow restraints or thick mitts may be required to prevent your child from physically removing the patch. - Reduce skin irritation from the adhesive. You can do this by applying medicated ointment or moisturizers over the affected skin area after removing the patch. Alternatively, apply Maalox liquid antacid on the skin around the eye and allow it to dry first before placing the patch. This way, when the patch is removed, it peels off the dried film of liquid and irritates the skin less. For children who do not tolerate occlusion, there are 2 main alternatives: prosthetic contact lenses and atropine penalization. Prosthetic contact lenses are specially designed contact lenses that are opaque and are able to stop light from entering the eye when worn. Wearing the prosthetic contact lens in the stronger eye gives the same occlusion effect. The great advantage of these lenses is that they will not affect your child's appearance and may help with compliance for difficult cases. The disadvantages are that these lenses can be expensive, require contact lens fitting and may also be poorly tolerated if not fitted properly. Atropine penalization involves using atropine eye drops on the good eye to blur the vision through dilation of the pupil. This forces the lazy eye to work harder to strengthen its vision. The advantage is that there is no need to constantly check that your child is wearing the eye patch properly. Studies have shown atropine penalization to be similarly as effective as occlusion. However, atropine does have its disadvantages. 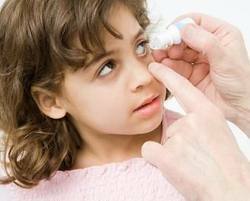 The atropine eye drop can sting when it is instilled into your child's eye. Atropine also has side effects that include light sensitivity (due to the dilated pupil) and reduced ability to change focus (after long-term use). Are there any possible treatments in adults and older children with amblyopia? Occlusion has been found to improve the vision in the amblyopic eye - but only over the short term. For this reason, early treatment before the age of 8 has always been recommended to ensure the best possible visual outcomes. Computer vision training programs have recently been introduced that help amblyopia by stimulating and training the brain to improve visual processing. These neural vision training sessions with the computer involve a series of repetitive visual tasks which encourage the brain to become more efficient in processing visual information. So far results from clinical trials have been promising. One study reported that 70.5% of amblyopic patients aged 9 to 54 years attained a visual acuity improvement of 2 lines or more. What is not known is how long the effect is maintained for, and whether this can benefit those with severe amblyopia. RevitalVision is currently the only computerized visual training regime FDA-approved for amblyopia in children aged 9 and above with vision of 20/100 or better and little or no strabismus. 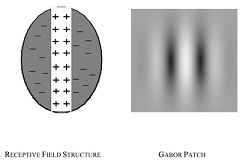 It uses the principle of Gabor patches to improve contrast sensitivity and visual acuity. Early detection and treatment of amblyopia is still the recommendation from eye healthcare experts. There is no substitute for stimulating normal visual development from young as there is always the potential for permanent sight loss in later life that cannot be made better. Most amblyopic children who are detected early and treated appropriately do extremely well and achieve good vision in the long term.